Shopping for Harley Quinn Action Figures? Coldblooded, yet in some ways charming. You'll fall in love with this Harley Quinn action figure! Designed by Tetsuya Nomura, she stands 10 3/4-inches tall. A syringe-shaped weapon and armor appear upon deconstructing her mallet! 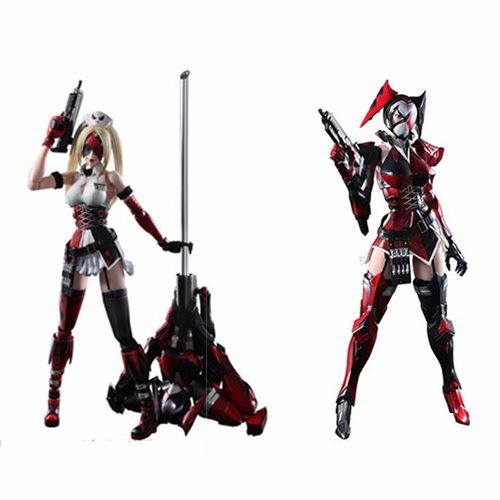 Harley Quinn, the female villain deeply in love with Batman's arch-enemy, The Joker, now appears as this plastic DC Comics Variant Harley Quinn Play Arts Kai Action Figure. Designed by Tetsuya Nomura, her costume takes inspiration from a nurse's outfit and adds what could be identified as her signature colors, black and red, to the overall white color scheme. This coquettish design definitely expresses her character and personality! A syringe-shaped weapon and armor appear upon deconstructing her mallet, and the figure also includes various other accessories that help showcase the various sides of Harley Quinn. Harley stands approximately 10 3/4-inches tall, and her mallet measures about 12-inches long. She comes with a display stand, packaged in a window box. Ages 15 and up.